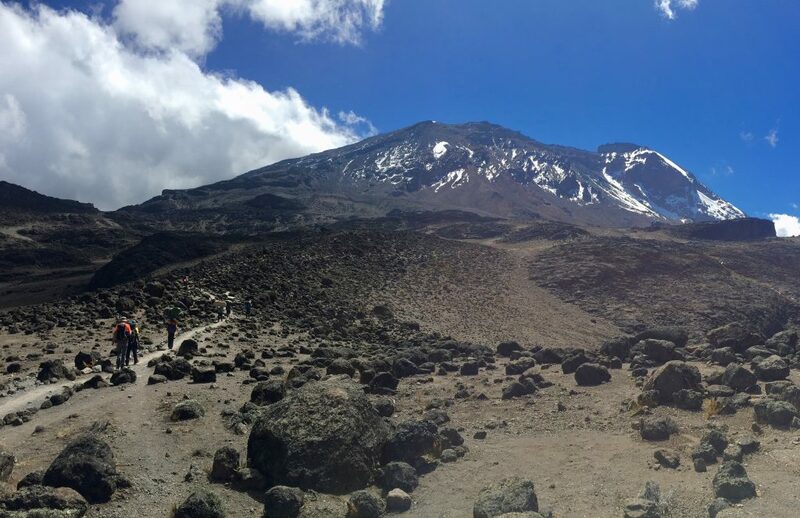 Tanzania’s Mount Kilimanjaro is a dormant volcano with three cones – Kibu, Mawenzi and Shira. It is the world’s tallest free-standing mountain and at 5,895m, its Uhuru peak on the Kibu cone is the highest point in Africa. It’s one of the continent’s iconic images and for many people the first thing that springs to mind when they think of trekking in Africa. We debated for a long time whether to climb it and after eventually deciding we would, it was the only thing we booked before leaving London. 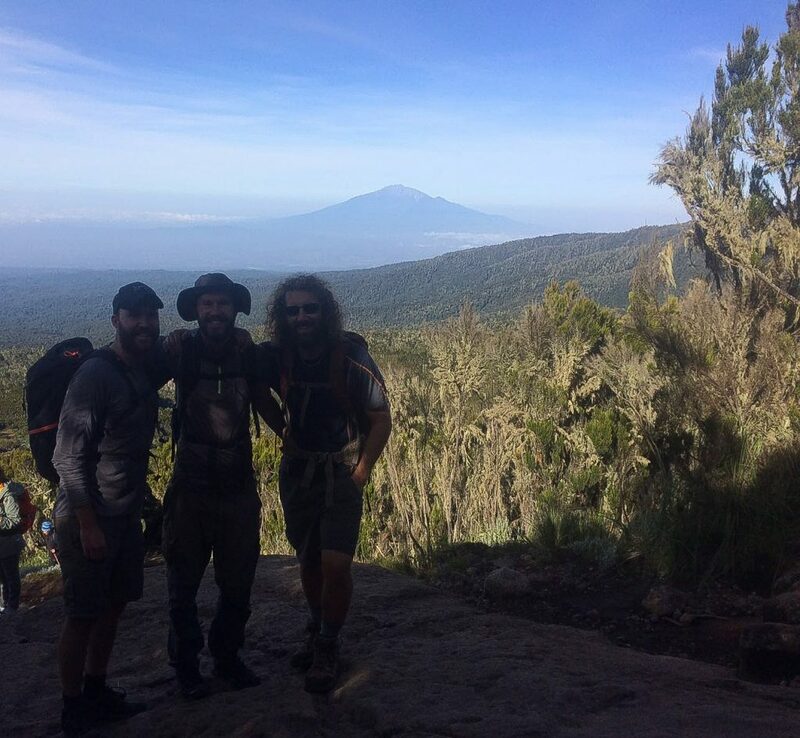 Having done a lot of fantastic trekking since we arrived in Ethiopia over five months ago, we were feeling really fit and excited for the challenge. There are a number of routes up the mountain, hundreds of companies and even more opinions on how to do it. After lots of research, we decided on the six-day Machame Route, and having met Ema on Mount Meru two years ago we booked our trip with Origin Trails. It was unbelievable to have Dyl and Zoneboy join us. Climbing a mountain really is a fantastic way to catch up with special friends. It wasn’t a long drive from Moshi to the Machame gate and when we arrived there were people absolutely everywhere. Guides queuing to finalise paperwork, porters at the weighing stations to ensure no one was carrying more than 20 kg and clients waiting around for the signal to head off – twende (let’s go)! We knew it would be busy but nevertheless, seeing hundreds of people at the gate felt a little uncomfortable. 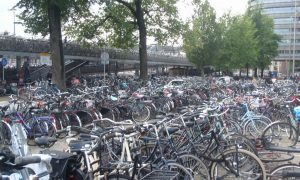 At the same time, though, we could only admire what a logistical operation it was. After sitting around for a while waiting for the park’s computer systems to get back online, we eventually set off with excited high-fives and big smiles all round. 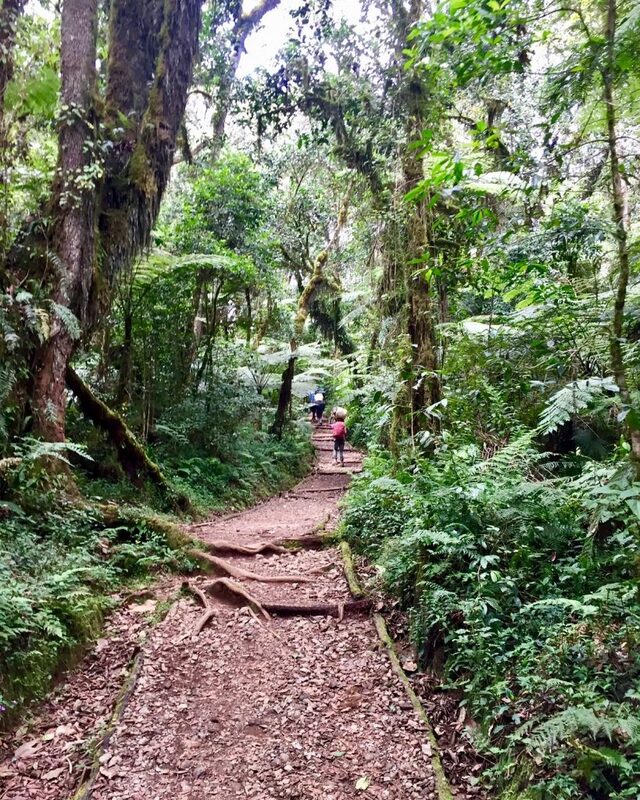 Similar to our treks on two other dormant volcanoes; Mount Kenya and Mount Elgon in Uganda, it was a very pretty walk through different vegetation zones. Here beautiful, dense montane forest with magnificent old trees gave way to alpine moorland with giant sonecias, which in turn gave way to rocky alpine desert and lastly, at the summit, snow and stunning glaciers. Trekking at the very end of the season, we were incredibly lucky with the weather enjoying beautifully clear mornings throughout. 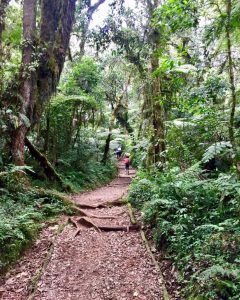 After walking through the forest on the first day, for the next two days there were stunning views in all directions – behind us was the forest, Mount Meru and Shira while in front loomed the snow-capped peak. By late morning, these peaks were often in cloud and by early afternoon when the rain joined us, we were in our mess tent enjoying a few games of cards and many cups of tea. It would often clear as the sun was going down so we were rewarded with one last peek of the summit from the scenic campsites. Given all the foot traffic, it was a really good path and with the location of camps well thought-out, days were no longer than five hours, which really suited this weather perfectly. On the fourth day, we headed out of the Karanga valley and started climbing more steeply towards base camp from the back of the peak. After a late afternoon dinner and an early night, we were up at midnight and off just before 1am for the summit. It was almost a full-moon so there was no need for our head torches until we were in the shadows and as we set off, the lights of Moshi shone below and to our right, the jagged Mawenzi peak glowed in the moon’s light. It wasn’t too steep a climb on the zig-zagging path until around 30 minutes before Stella Point. From Stella Point, it was a further flat 45 minutes though we were now exposed on the summit face and a freezing wind whipped across our faces. After a frozen snickers and with a final burst of energy, just after 6am, all walking arm in arm with our guides for the last stretch, as the sky turned orange and yellow we stood on the roof of Africa. It was exhilarating and very emotional to watch the sun rise over Africa. 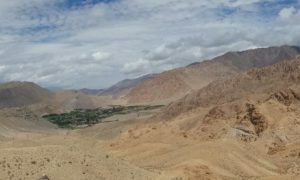 The views from the summit were stunning and perhaps the highlight of the trek. 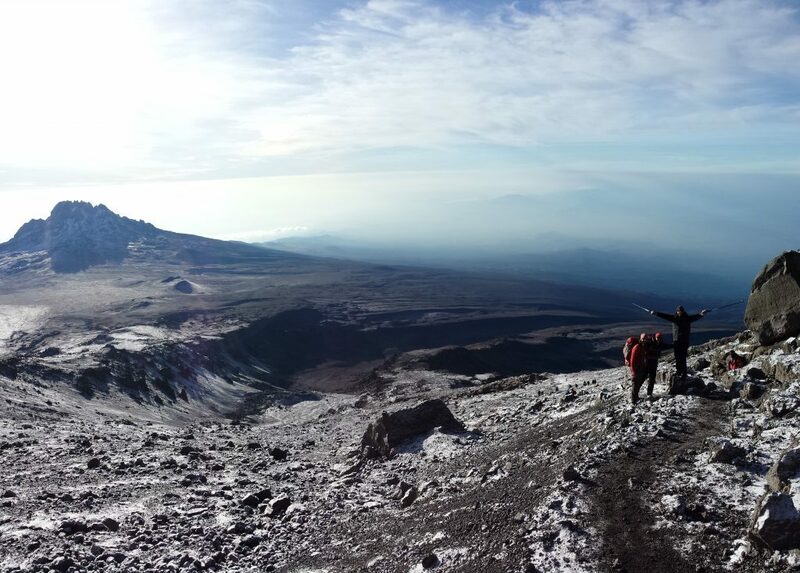 We had Mount Meru to one side, Mawenzi below and all around a number of enormous glaciers. As the sun eventually started warming our fingers, we made our way down with Mawenzi dominating the sky – line all the way home. We continued taking off layers as the sun warmed us up and after a lovely nap and breakfast back at base camp, we continued our descent. 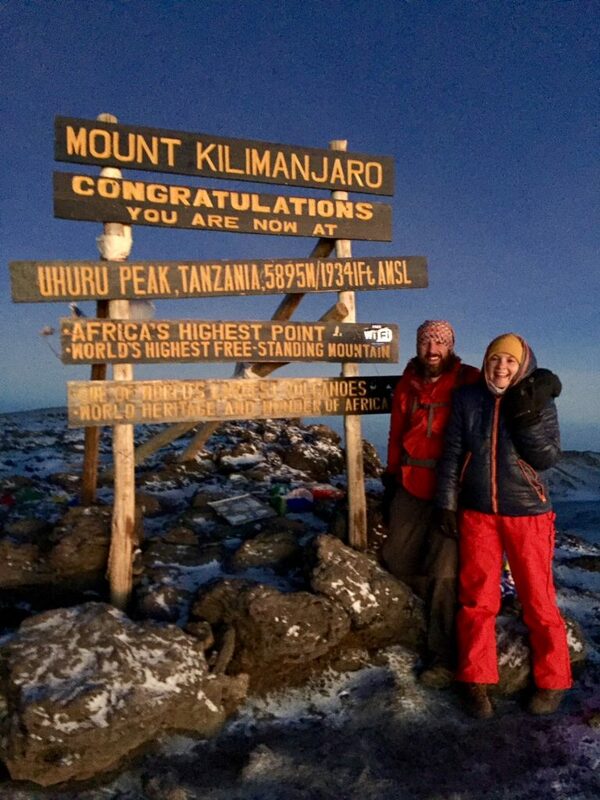 It was a long way down, and steep in places, to Mweka Gate where we signed the register for the final time, said our thank you and goodbyes to our brilliant crew and picked up our certificates. The drive back to Moshi was quiet as we all took in an amazing few days and the Kilimanjaro beers definitely tasted a little sweeter that afternoon. 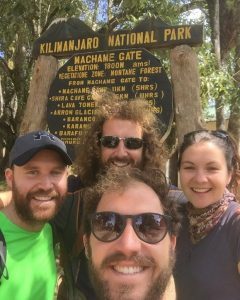 We debated for ages whether we would climb Kilimanjaro. For the same price, you could trek for weeks, even months, in other parts of the world. On the flipside, we felt we would probably never be as fit as we are now, and as the glaciers are melting the mountain would be a different walk. The trek was much prettier than some other accounts we’d read and the summit views really were spectacular. 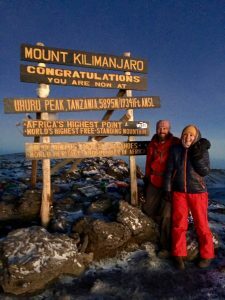 Climbing any mountain is an amazing experience, but this felt really special and the feeling of standing on the top of Africa is unforgettable. Aside from the summit, thankfully it didn’t feel as crowded on the mountain as we had feared at the gate. We booked our trek with Origin Trails and overall, they were excellent. You can read my review here. 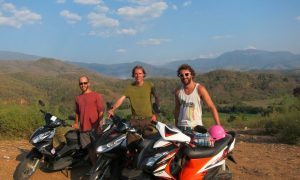 Renting gear in Moshi is super easy. We rented an extra-warm down jacket, thermal gloves and leggings. Proper gloves and socks will make it a far more enjoyable trek. We were incredibly lucky with the weather and it had the potential to be a lot wetter and colder. It gets cold at night and was freezing at the summit. This is a very tricky question but I’d say it’s not a challenging walk if you’ve got some experience and are reasonably fit. The altitude and weather are the only contenders for problems. 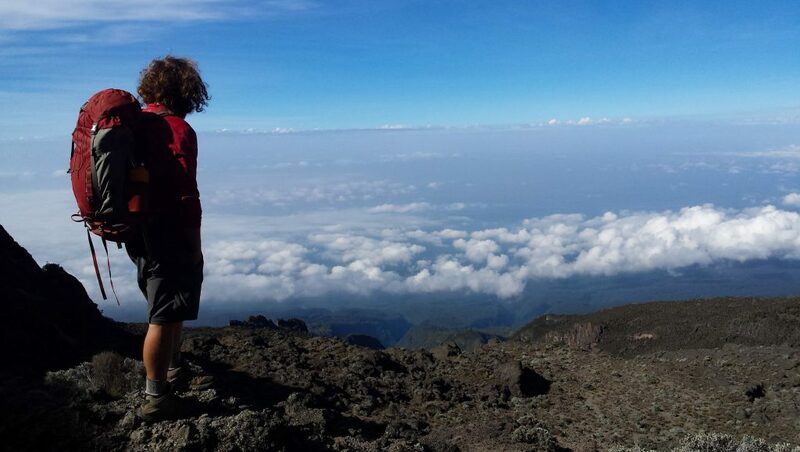 Taking time to acclimatise is critical and one of the reasons we opted for 6 days over 5. 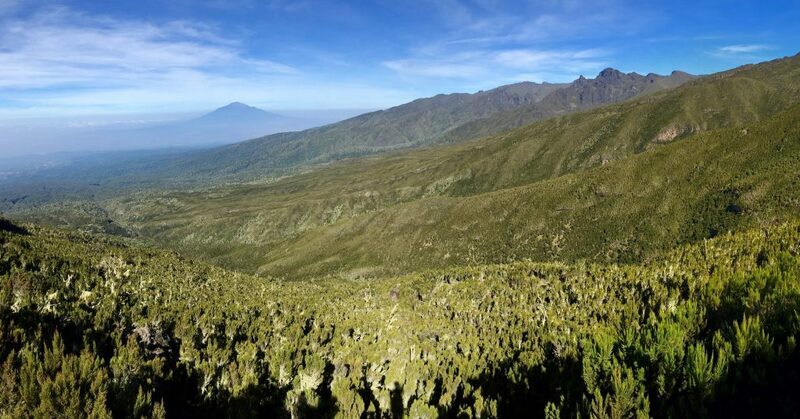 If you’re able to squeeze in Mount Meru before, not only is it a phenomenal walk in itself but it will likely increase your enjoyment of Kilimanjaro by getting you acclimatised. 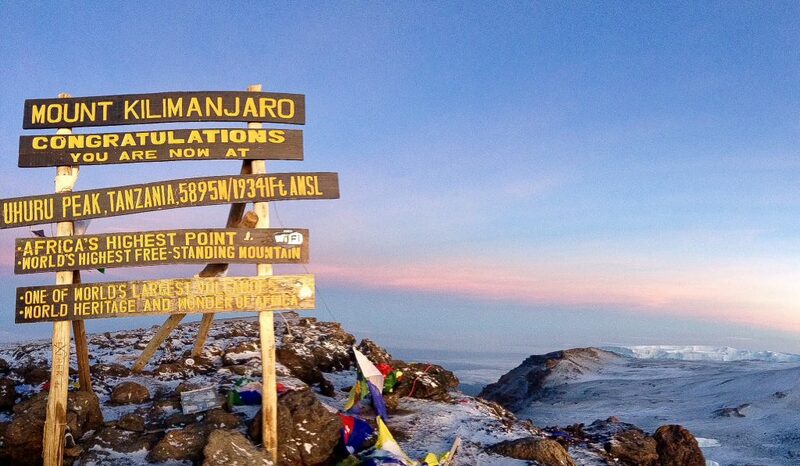 I thought the summit walk to Meru was tougher than Kilimanjaro. 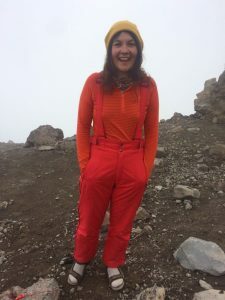 The trek will also be far more enjoyable if you have all the right gear and are warm enough on the summit climb. This included all equipment (tents, sleeping bags, roll mats), two guides, porters, chef, all food and accommodation the night before and after. Please bear in mind that park fees are around $800. We thus thought the price was fair given these fees and the crew required. A red ski onesie for Catherine – priceless! Make sure you check the numbers of porters before you go. We made it very clear beforehand we didn’t want a waiter or our own toilet so it’s worth confirming with your company. Every camp has a bathroom though they can become pretty grim very quickly with so many people using them. * Finally, a big thank you to Zoneboy for sharing some of his pictures.